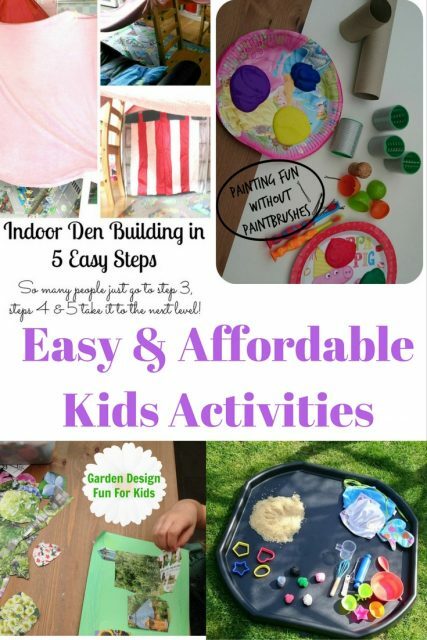 Share the post "Easy & Affordable Kids Activities"
With half term just around the corner, I thought I’d share a few easy and inexpensive ideas for keeping the kids entertained during their time off. I had a little look back over some of the things that we have tried and enjoyed, and I’m really glad that I did as I had forgotten a fair few of them! Thanks to writing this, I can now see us having a full and fun week, without it costing the earth. So here are a few suggestions that you might like to try, just click on the activity and it’ll take you through to my original blog post about it…. Indoor Den-Building. This one never fails, never. It is always a huge hit here and is so easy to do. Do follow all of the steps, though, don’t miss the fun ones out. Wild Art. So simple to do. It’s free, it’s creative, it involves fresh air – what’s not to love?! Painting Fun Without Paintbrushes. This one will get messy, so I’ll put that out there now! But it’s a lot of fun to watch them do and you can be really creative with what they use to paint with, grabbing random things from around the house. Happyland Hunt. OK, so it doesn’t have to be Happyland people that you use! In fact, I am going to do one of these for the kids next week, but it will probably be a Teenage Mutant Ninja Turtles and Star Wars hunt. Water beads play. These are so cheap, yet have given us hours worth of play! Tuff Spot Recycling Play. I’ve chosen this one as the chances are you have a pile of stuff in your recycling bin that you can use, meaning it will take you just moments to set up. Another firm favourite here is Baking Fun in a Tuff Spot. In fact, anything Tuff Spot is likely to go down well. I have a Pinterest board full of other tuff spot and small world play ideas if this appeals and if you’ve not got a tuff spot, I bought mine from Amazon – Mixing Spot/Mixing Tray. (made in the uk) by Keto Plastics . Colouring and Crafting with Free Printables. This one includes links to some great places to find and print free colouring activity printables for children. Mess-free, low maintenance and if you’re lucky, quiet! Leaf Hunt. I vividly remember doing this and it was actually three years ago! This is a simple leaf hunt (there’s a link to a leaf ID sheet included) followed by a little leafy crafting at home. Garden Design Fun For Kids. This one is all about creativity, cutting and sticking, and it really needn’t be about gardens, it can be absolutely anything that you want. I’m going to have a rifle through my magazine pile and see what themes I can come up with for the children to try. And if you fancy just hunkering down and staying home, it’s got be board games, hasn’t it? 10 Brilliant Board Games for Kids. My two really enjoy their games, as do I. There’s a great variety on this list so that they suit differing ages and some can while away the odd hour, whilst others are nice quick plays. Hopefully I’ve managed to come up with at least a couple of ideas that appeal to you here. Do let me know if you give them a go and I’m always happy to hear any suggestions for my two to have fun with. Mummyccino and I love board games!